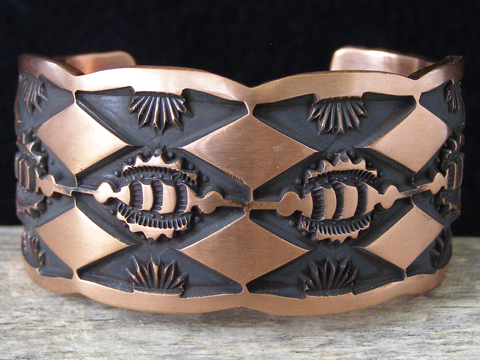 Jerald Tahe Deep-Stamped Copper Bracelet size 6 1/2"
Jerald Tahe is the son of Emerson Bill and Nora Tahe Bill and he makes bracelets in the style that his father pioneered and then taught his mother to make. His work is every bit as detailed and exacting as that of his parents. Some of his bracelets are deep-stamped in one layer of silver while others are overlaid pieces consisting of two layers of silver soldered togeher for extra thickness. This bracelet is made with thick, sturdy copper and decorated with extremely deep stampwork that encircles the entire cuff from terminal to terminal. Hallmarked J TAHE and stamped STERLING inside the cuff.